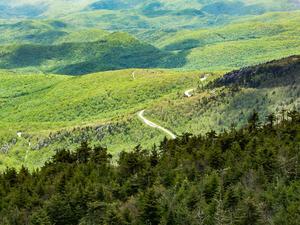 Ascending Grandfather Mountain's Profile Trail, this hike takes you past some of the features that inspired its name. 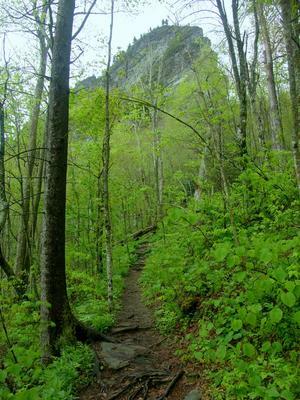 You'll ascend from the middle elevation creeks and streams, past a variety of features including views and rock outcroppings, and onto the summit ridge where a rare spruce-fir forest grows. Bring your camera, because a nearly endless supply of scenery awaits, and the trek is strenuous enough that you'll want to rest periodically anyway. 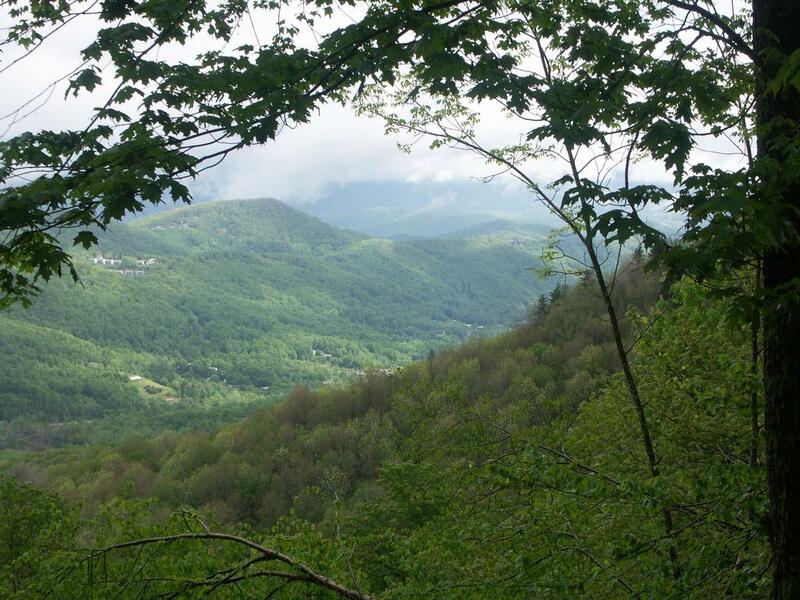 The hike ends at the top of Calloway Peak, which at 5964' is the highest mountain in the Blue Ridge range. Start the hike by filling out a (free) permit at the little shelter at the downhill end of the parking area. All hikers are required to carry a permit, so keep a copy with you on the trail. The shelter has some informational signs, and some places to relax - maybe eat a snack or lunch before hitting the trail. Once you're registered, take the trail from the back of the shelter, which descends and almost immediately crosses the Watauga River on some big stepping stones. Ferns grow on the rocks beneath straight birch trees below a little cascade on Shanty Branch near the start of the hike. Unless the water is very high, this should be a dry crossing, since the Watauga is just a medium-sized creek at this point. The trail follows the river downhill on the other side, and it undulates up and down some, with a few side curves into smaller adjoining coves where streams flow in. There are some great photo opportunities here and it's a nice easy hike, but you're right below the highway so it's kind of noisy. (In fact, the only real complaint I'd have about this hike is that the faint sound of traffic - especially motorcycles - stays with you all the way to the summit). The forest at this point is mostly mid-elevation and cove hardwood trees, with plenty of rhododendrons in the understory. 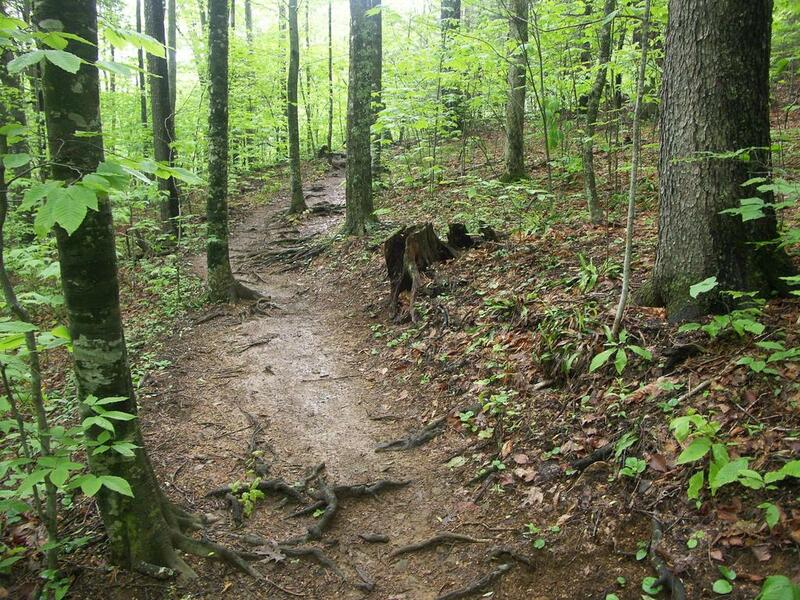 After less than 1/2 mile, the trail swings right and begins climbing. 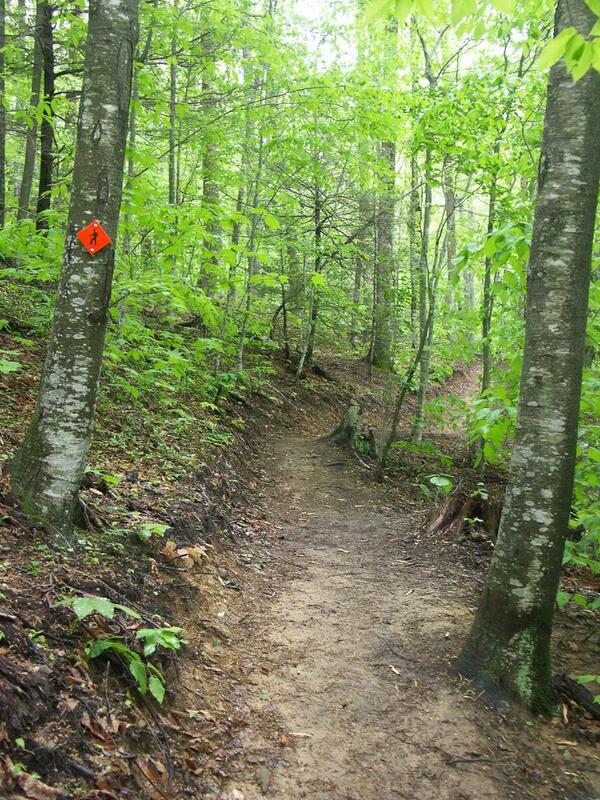 It's not too difficult at first, and the trail is well-graded and well-maintained. (Last time I hiked here a considerable amount of tread work had just been done on the trail, making it a bit muddy - but that should dry out over time). 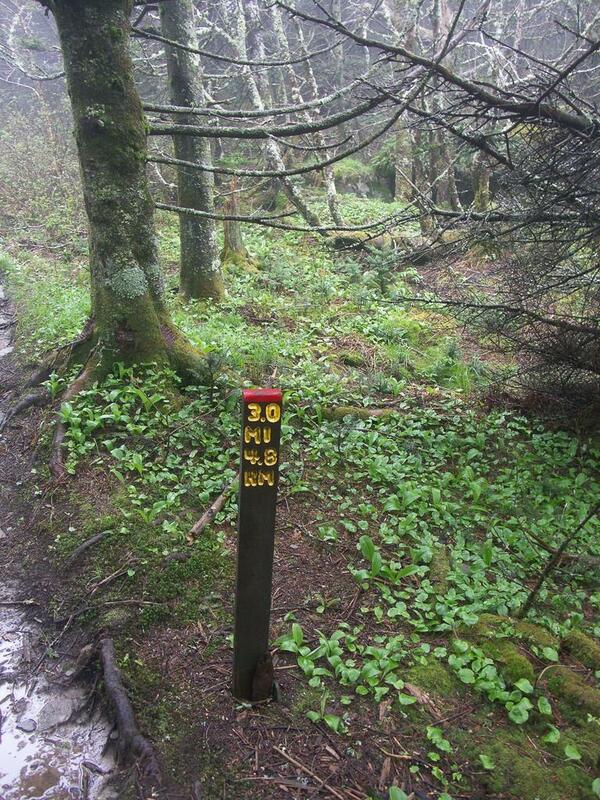 You'll see the first handy half-milepost beside the trail. 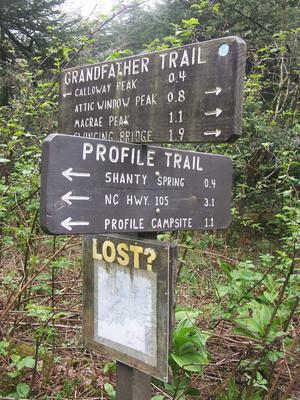 These are present all the way to the top of the mountain and indicate how far you've gone or have left to go. There are some roots and rocks to contend with, but nothing major. The trail winds up onto a low ridge with lots of beech trees, then heads back into a larger cove where you cross a stream. Some rather large trees grow here (as they do all the way up the trail to the spruce-fir zone). The Profile trail on a steep slope with some big trees. 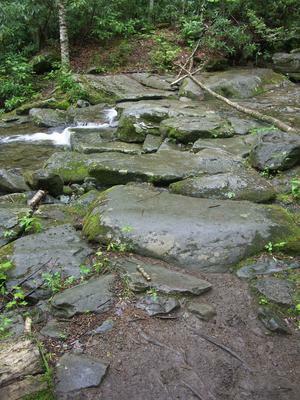 The trail exits the cove and dips into the next one, where you cross scenic Shanty Branch on very large, parallel rectangular stepping stones. 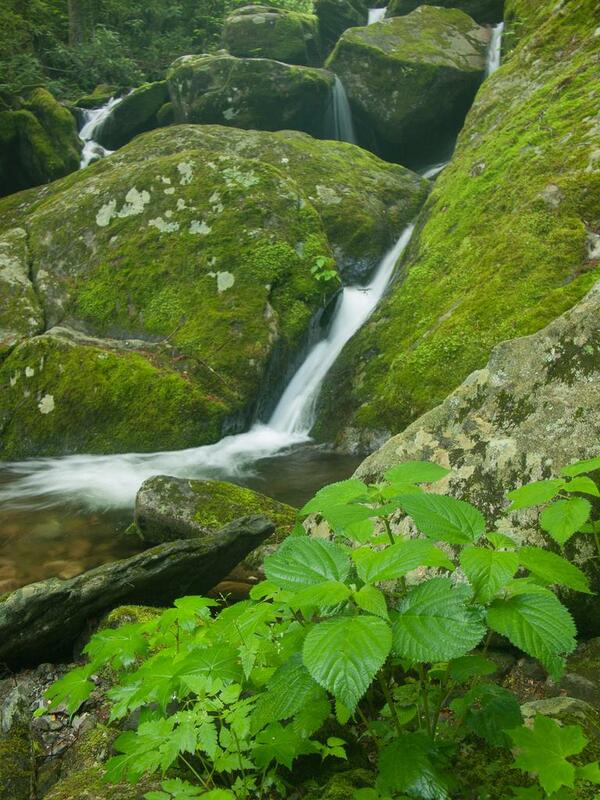 A small cascade is just upstream, and a larger one is just downstream. 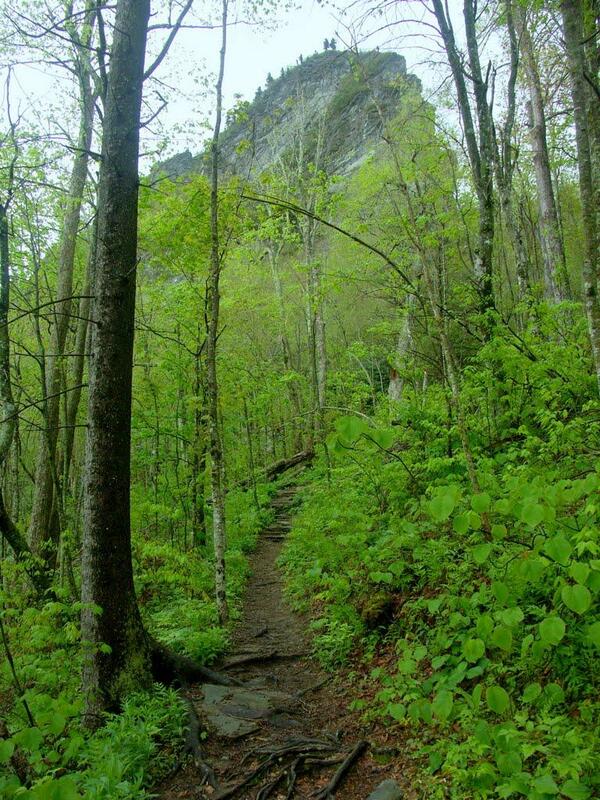 To get to it, stay on the trail - it heads down slightly and you'll see the cascade on your left where there is a large overhanging bluff on the right. Rocks capped with ferns make this a very inviting area to hang out longer than you should. The trail climbs again past the bluff, and gets a bit steeper, but not terribly so. 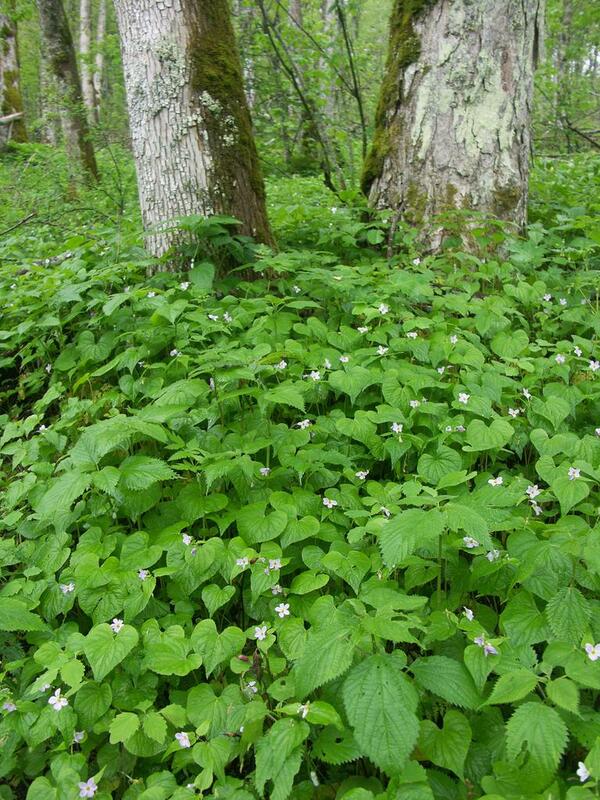 It wraps into progressively drier coves as far as running water goes, but lush carpets of greenery and wildflowers still grow on the rich soil of the forest floor. 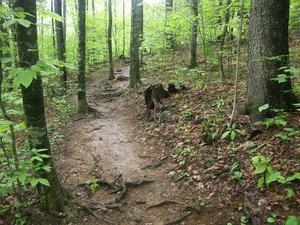 The trail then begins a series of switchbacks taking you to progressively higher elevations. A few Red Spruce trees start to mix in with the hardwoods as you move through 4000 to 4500 feet in elevation. Foscoe View makes a nice little rest stop at approximately the halfway point of the hike (distance-wise), with limited vistas to the north and west. 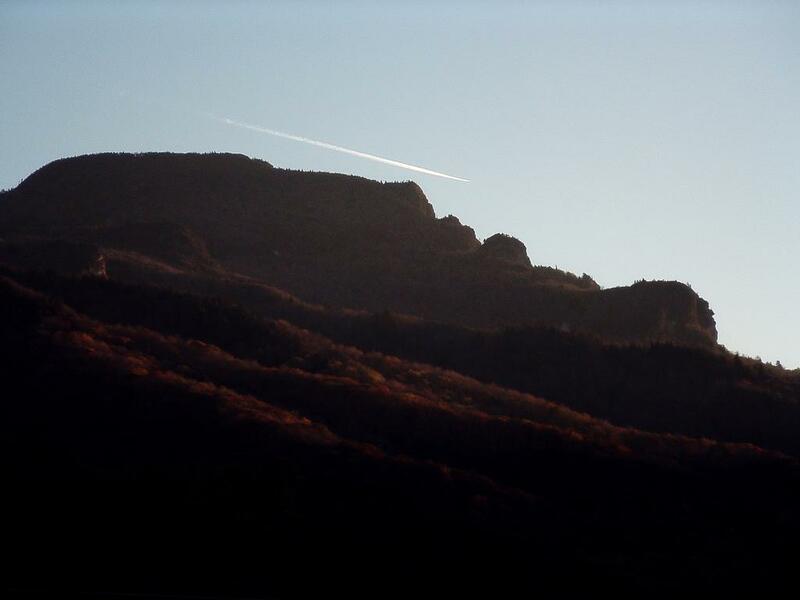 You can see lots of development on the surrounding mountains, making it apparent why protection of land on Grandfather Mountain is so important, and the Amphibolite Mountains near the horizon. Beyond Foscoe View, the trail starts getting rockier, but isn't quite truly difficult since most of the rocks are artfully arranged in a stair-step fashion. Another series of switchbacks will provide more views up to the looming Profile Cliffs above you than down to the valley if the leaves are off the trees. You'll soon pass the Profile campsite on the left. The view of Green Ridge from NC 105 provides another possible explanation for the Grandfather and Profile. The trail for this hike climbs the ridge near these rocky features. The section of trail just beyond the Profile campsite goes through a wetter area, but it is almost entirely paved with hundreds of huge, flat stones. 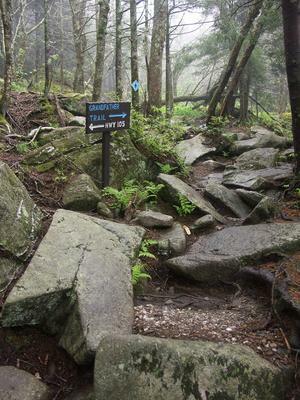 Named "Peregrine's Flight", this part of the trail is as outstanding to the world of trailbuilding as the infamous Linn Cove Viaduct of the Blue Ridge Parkway on the opposite side of Grandfather Mountain is to roadbuilding. The trail was built by Kinny Baughman and Jim Morton using nothing more than hand tools - iron rods, shovels, pulleys, and winches. 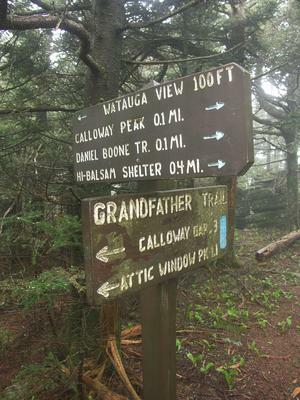 According to rangers I've spoken with on the mountain and an article in the Mountain Times, it was built between 1985 and 1989 in order to replace the soon-to-be-obliterated Shanty Trail and preserve hiking access to the west side of Grandfather Mountain. Baughman is quoted as referring to the Profile Trail as his "lasting legacy", and with that I'd agree - the course of this walkway, defined in stone, looks like it could easily be here for centuries, and it is a true pleasure to hike. 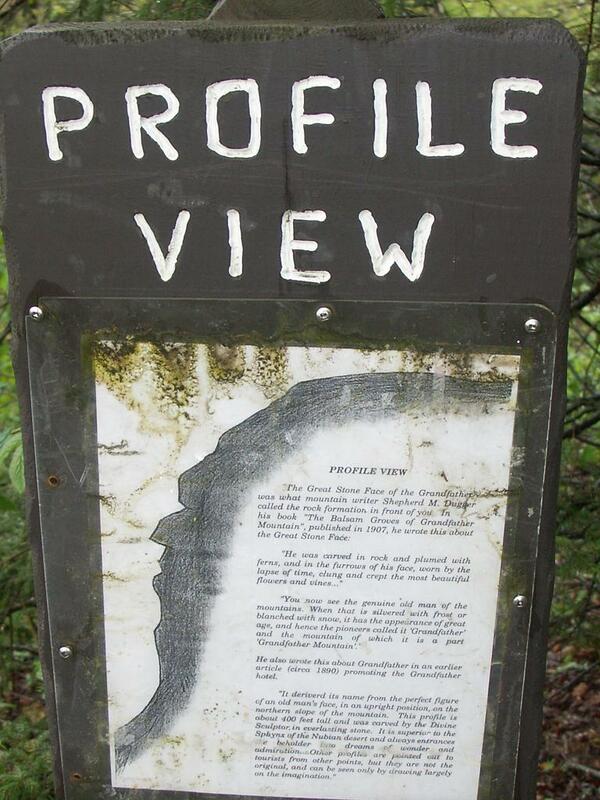 Grandfather's Profile, allegedly for which this trail and mountain is named. 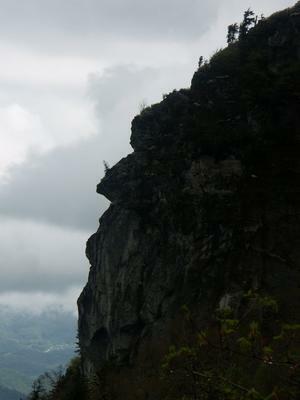 After passing a few more switchbacks and rock outcroppings, the next view you'll see is of the Profile Cliffs and is called - appropriately - Profile View. 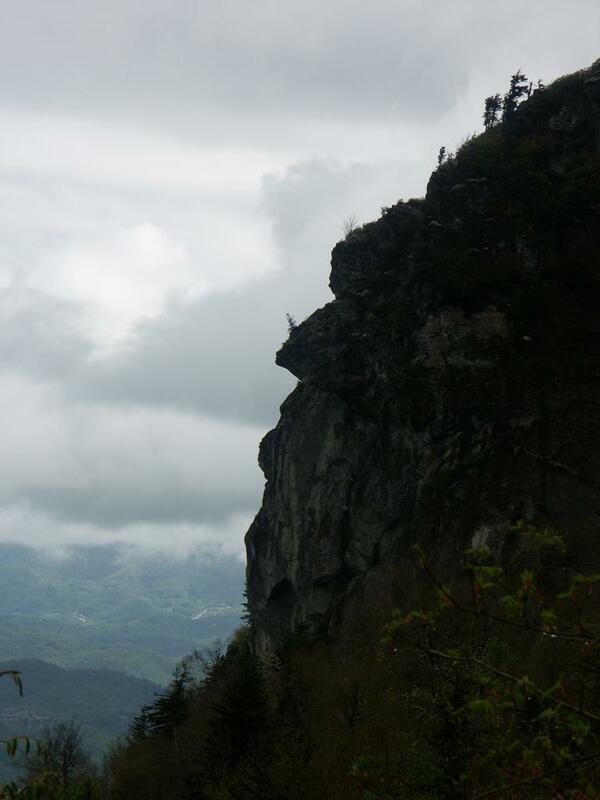 This is one of the views which give Grandfather Mountain its name - the rocks do indeed look like the profile of an old man's face. Another view, from along highway 105 near Foscoe to the north, shows another way the mountain could have been named. From that view, the old man looks like he's lying on his back. Around this altitude, also notice how much deadfall is on the ground, and how many broken limbs the standing hardwoods have in their crowns. 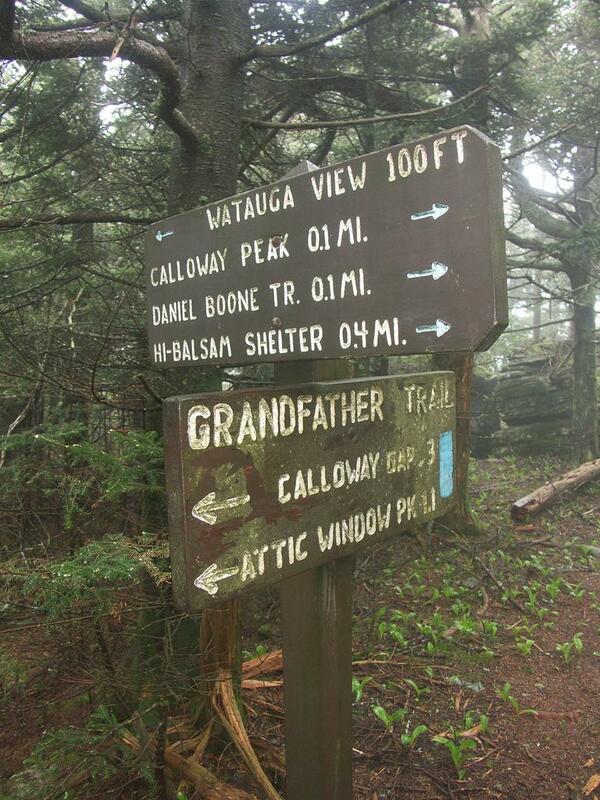 This is the result of some very severe ice storms that have hit the mountain in the 2000's. Some of the standing deciduous trees are little more than a huge, thick, sturdy trunk with not much to show in the way of branches - those having been stripped off by deep snow, ice, and fierce winds. The hardiest of the trees survive, and some are quite old, but they have had a rough time of it. This partly explains why the Spruce and Fir trees become more common at these higher elevations. Even though Red Spruce, for example, seems to grow faster in warmer temperatures found at lower elevations, they're less prone to damage from winter weather than the hardwoods, making it easier for them to compete for sunlight up here compared to those that sprout farther down slope. 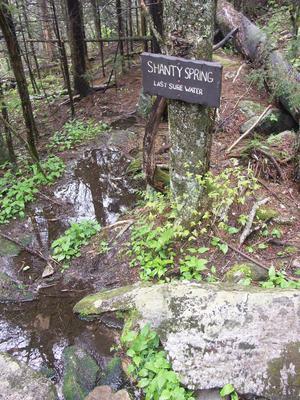 The trail continues up to cross the uppermost reaches of Shanty Spring Branch, with the water running cold and clear between huge channels in the boulders. 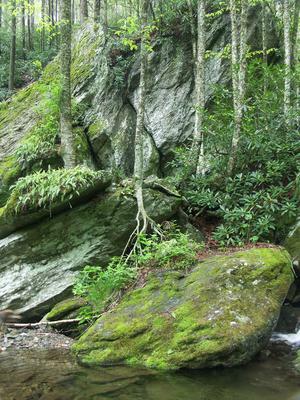 The spruce trees begin to dominate the forest as you climb, and a few Fraser Fir - which only grow at the very highest elevations of the Southern Appalachians - start to mix in. 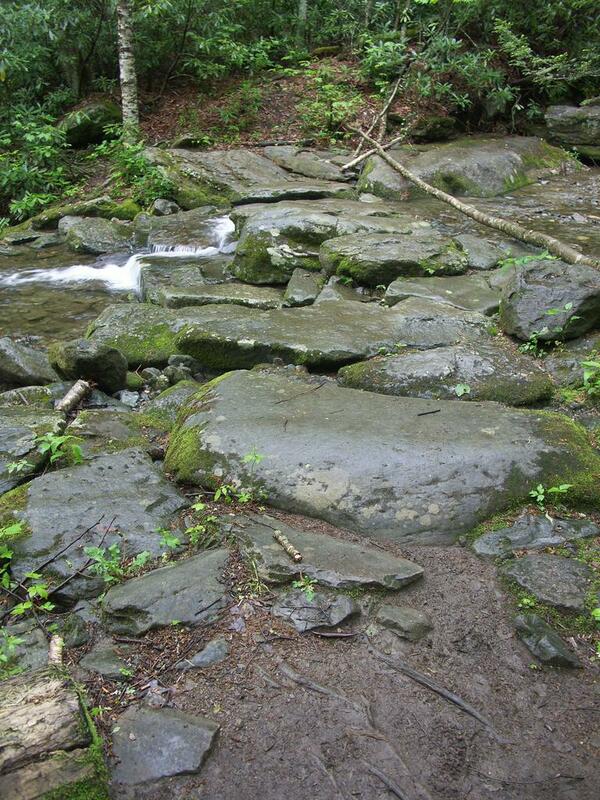 The trail gets steep, rocky, and wet on its last leg up to the piped spring and the small bluff that overhangs it. 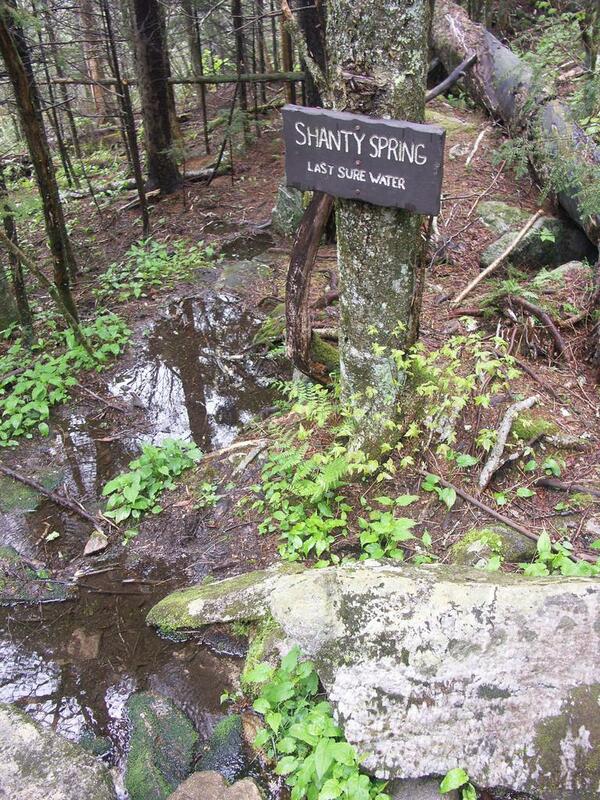 Rocky trail just beyond Shanty Spring. 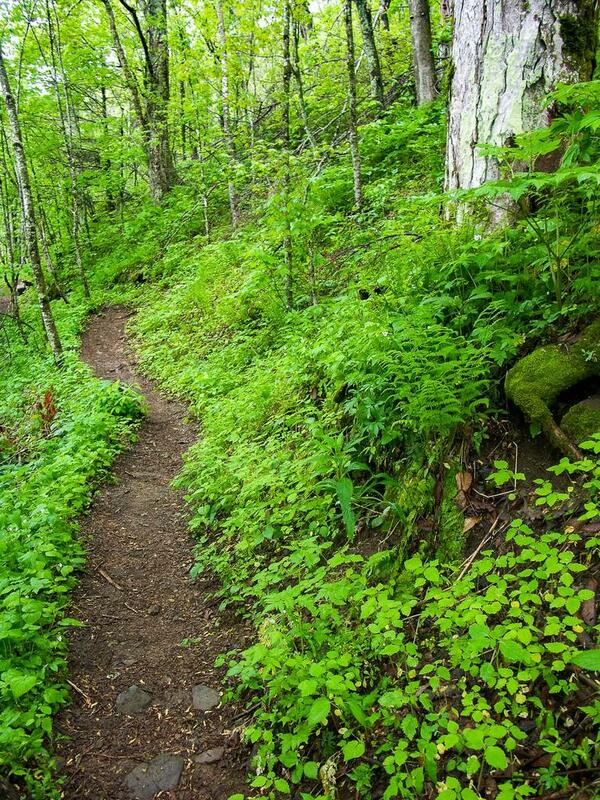 Despite being over 20 years old, the trail up to this point has been in great condition, without erosion, drop-offs, haphazardly strewn rocks, or undercut roots - having been purpose-built by experts. From here to the ridge, however, that changes drastically. All of those ankle-twisting things become common. 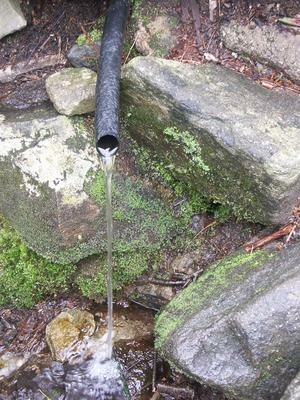 The "trail" you are following is simply the shortest historical route to the spring from the summit - which means it goes directly down the slope. It's also a lot older, and therefore more eroded. 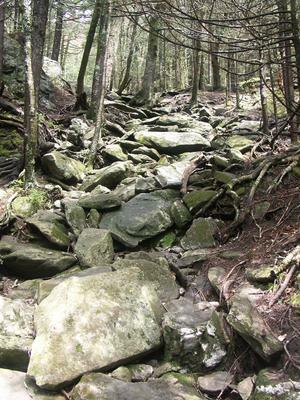 The end result is that you'll be walking straight up the mountain on a pile of boulders, stones, and bedrock, intermixed with hanging roots, through a very wet spruce-fir forest. It's never quite hand-over-hand difficult, but it makes for some slow going. Luckily, it's not very far up to the ridge line from Shanty Spring at only 3/10 of a mile. 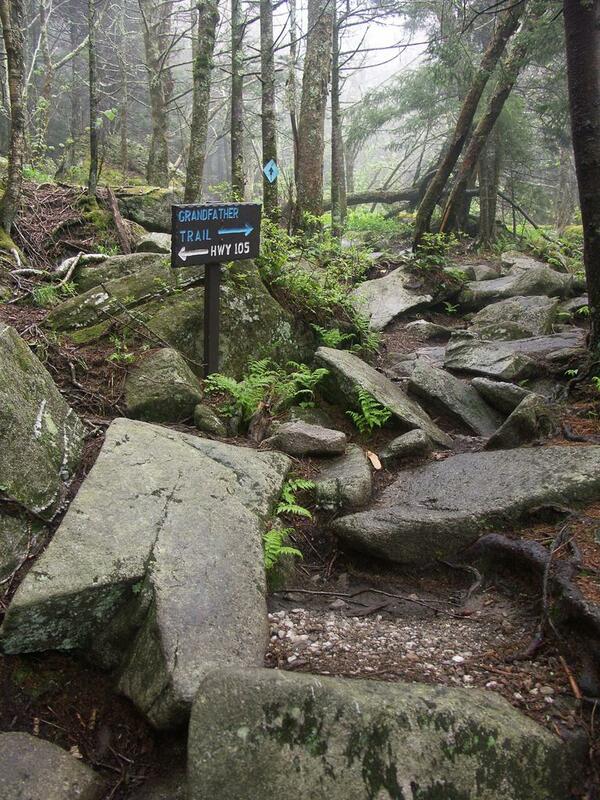 The Profile trail evens out and crosses the summit ridge in a little section of nondescript forest, and descends just a few yards to its unceremonious end at the Grandfather trail. A good directional sign does mark the spot, like most intersections in the park. To continue the hike up to Calloway Peak, turn left onto the Grandfather trail, which starts back uphill along the ridgeline through the spruce-fir forest and a few small openings filled with smooth blackberries. 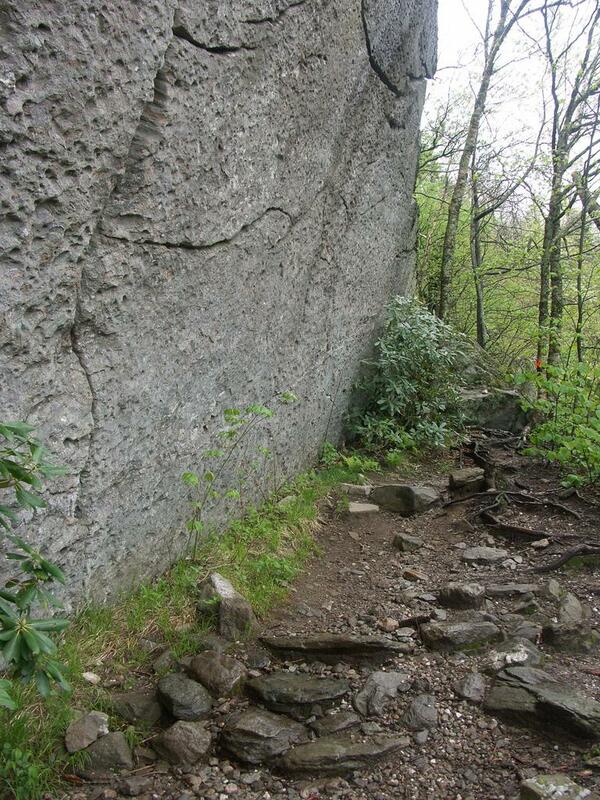 Though not as rugged as the peaks farther south, the trail does pass over some narrow, rocky sections of the ridge. So take your time when you get to them and enjoy the views which become more open as you go. There are no major intersections along this last stretch, but a side path to the right leads to a campsite with a sunrise view, and one to the left leads 100' to Watauga View, which is a great northwest facing rock outcrop - although a substantial part of that view is comprised of roads, luxury homes, golf courses, and shopping centers, covering both the valleys and even the mountaintops. 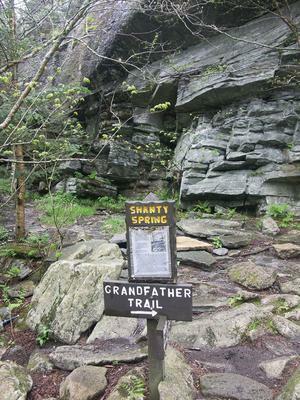 The Grandfather trail you are on is one of the oldest trails on the mountain, and travels along the summit ridge all the way from the Attraction area to the top of Calloway Peak. 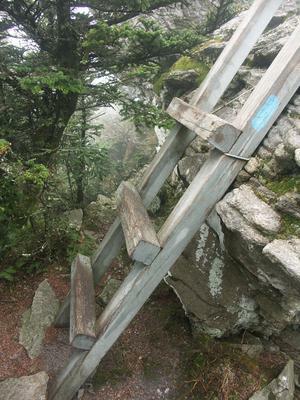 To negotiate some of the steeper rock outcroppings, the park has incorporated some big sturdy ladders made out of 4x4 posts into the path. This makes the climbs relatively easy, but not without some sure-footedness and risk. Pets may have trouble here, although my dog learned to climb the ladders herself with a little coaxing! The bigger ladders are further south along the Grandfather trail on MacRae and Attic Window Peaks; you'll encounter only a couple of smaller ladders on the 0.4 mile stretch up to Calloway Peak on this hike. View from the top of Calloway Peak, back toward the rest of Grandfather Mountain. Finally, the ridgeline starts to level out and you'll see the summit of Calloway Peak up to your right. The trail wraps around the rocks at the very top and climbs up onto them, making a steep right turn. The peak is marked by some blazes spray painted on the rocks for the Grandfather and Daniel Boone Scout trails, which both end here. 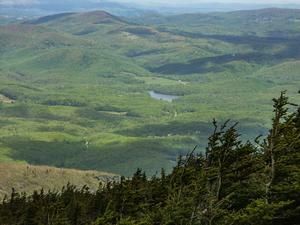 There is a sweeping, cliff-top view across the tops of the evergreen trees to the south and east. Thankfully, less development can be seen from here than back at Watauga View. 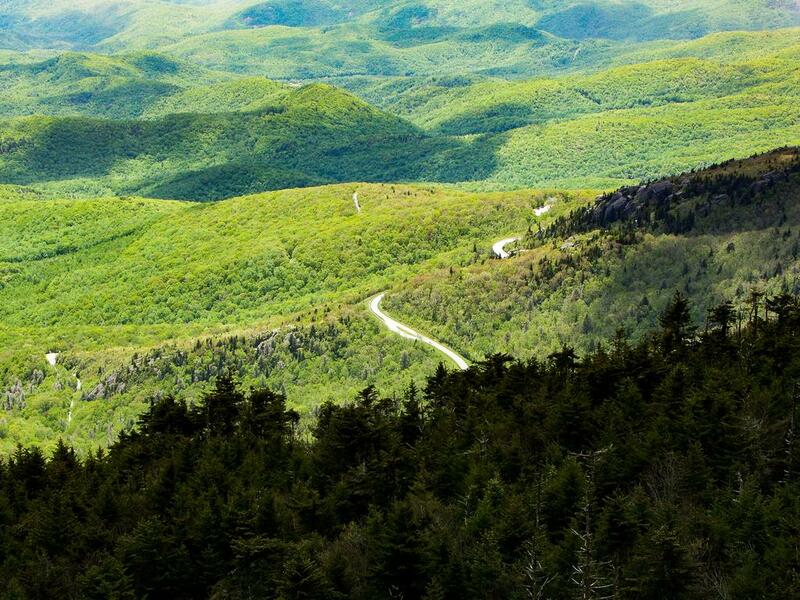 You'll see the Blue Ridge Parkway, part of the Linn Cove Viaduct, the Blue Ridge escarpment dropping away below that, MacRae and Attic Window Peaks back down the ridgeline, and mountains stretching in all directions. When you're finished soaking up the scenery, return to your vehicle on the same path to complete the hike. MHLC said: We just went on this hike today and it was gorgeous! However, there have been some renovations to the trail and there is a new parking area with a small restroom center at the trail head. 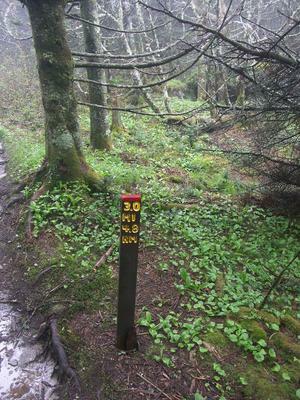 While the new parking location is only 0.3 miles from the old parking location (there are clear signs pointing you in the right direction), this changes the mile markers listed on the trail map found on the Grandfather Mountain website, as well as some of the mile markers on the actual trail. We anticipated the 7 mile round trip listed here, but all said and done it was about 8. 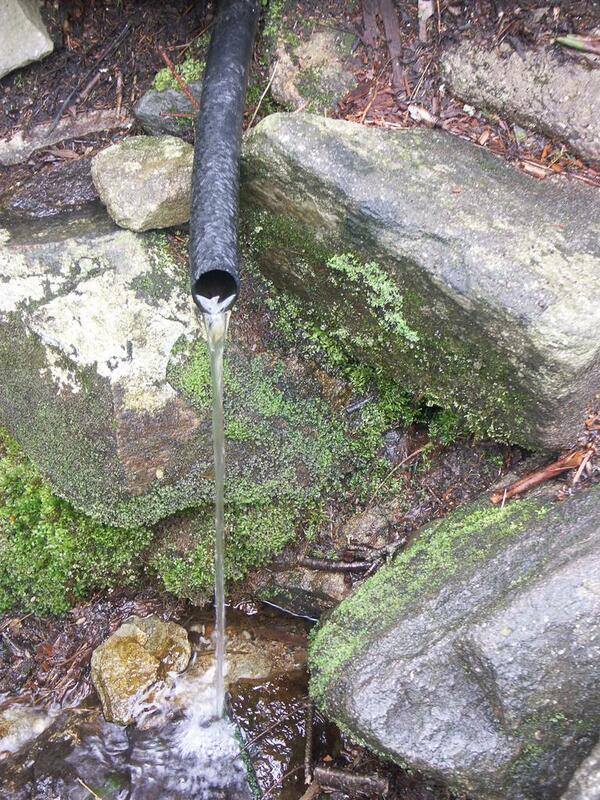 Just something to consider should you take on this challenging hike! Elicia Nolan said: Is there an app that you can recommend, that doesn't drain your phone too much, too quickly? 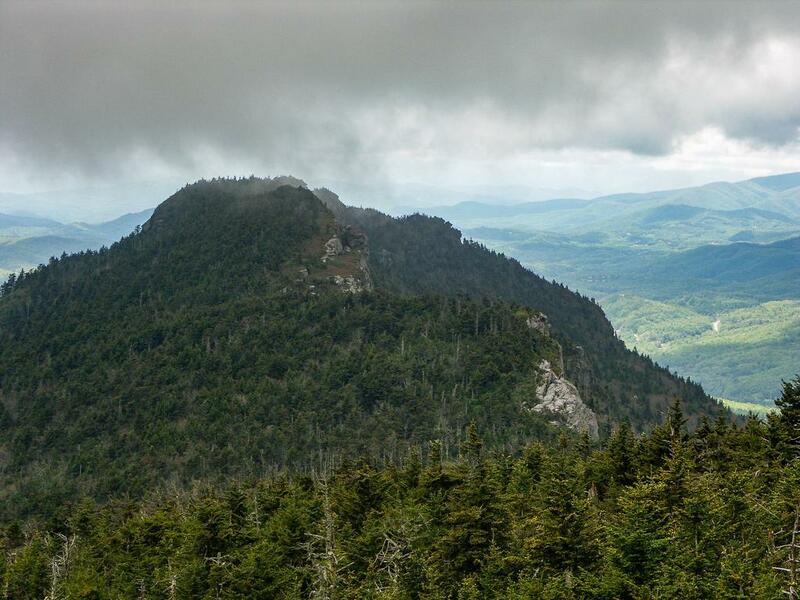 Jordan M. said: @Steve - it's debatable whether Mount Mitchell is actually on the Blue Ridge, though. 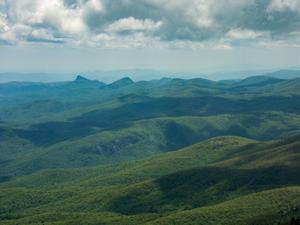 One definition of "the Blue Ridge" is literally the Eastern Continental Divide, and Mt. Mitchell is entirely west of that while it runs across the top of Calloway Peak. That's what we mean here, and by that definition, it's the highest peak directly on the Blue Ridge. If you're talking about the wider Blue Ridge Mountains range as defined by the USGS in general, then Mt. Mitchell - and indeed many others in the region - are higher. But I agree, the view is great from both! 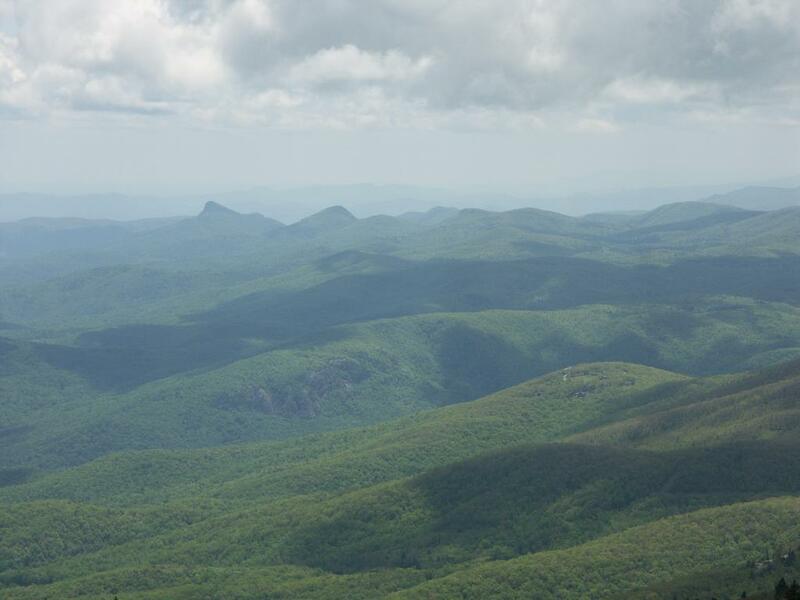 Steve said: Small correction- Calloway Peak isn't the highest point in the Blue Ridge range. That's Mount Mitchell at 6684'. 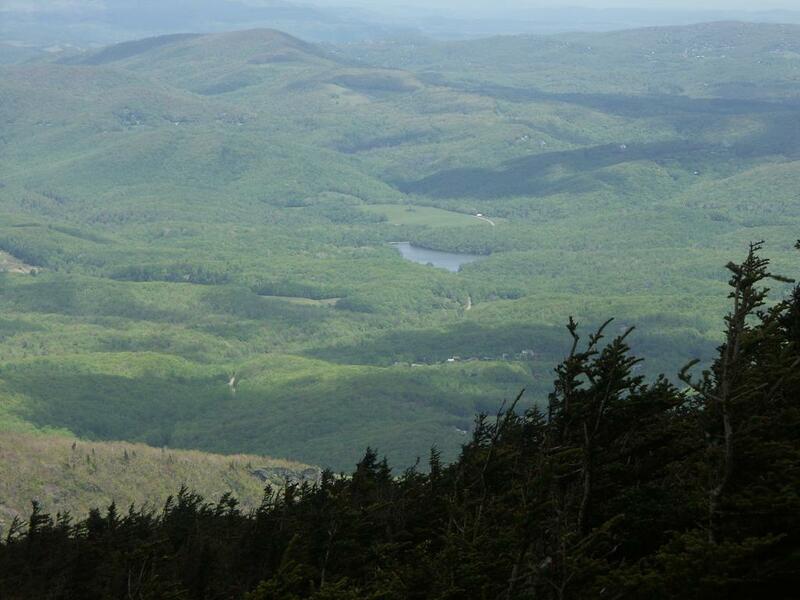 I think Grandfather Mountain is more scenic though. Backbone said: Great hiking experience. Only issue is periodic cold and wind which makes winter hiking difficult due to the amount of extra gear you must carry. Valerie said: We did this hike on October 23rd, 2013 and went from the top of profile trail to the swinging bridge. THIS WAS HARD! It was only in the 30's when we started at the bottom which was nice since I didn't get too sweaty. Up to the Grandfather Trail wasn't extremely hard (me with my hiking poles and hiking boots) though towards the top of the trail it is very rocky but nothing compared to going from where the trail meets up with Grandfather trail over to the swinging bridge! There is one part where we were climbing rocks, the open face rocks were VERY VERY windy too. And on the way back (BTW the top of Grandfather mountain was closed and only accessible by foot) it was colder and much more windy! We took the more protected trail because it would have just been too windy otherwise. That day we did a total of 10 miles round trip (3.1 profile trail and 1.9 grandfather to swinging bridge then back). Going back was harder than going up, my knees hurt so bad along with my feet. I think I have decided (after Mount Mitchell in June) no more of these long hikes, I guess my knees aren't meant to do these long hikes, I will keep it to under 6 miles from now on I think. This was definitely one of the better marked trails we have been on, though there was on part on Grandfather trail we got a bit confused because my husband missed the blue arrow but we found it pretty quick when he climbed down the rock to no where. Fred said: A note as to when the Profile Trail was built. Before my oldest son was born in 1978 (I can't recall whether it was in 1976 or 1977) his mother, another couple and I hiked (with full packs) the Profile Trail up to the Grandfather Trail and hiked some distance towards the swinging bridge, passing hang gliders launching off the cliffs above us. Have hiked PT many times since. The trailhead parking area off NC 105 as well as most of the rest of the trail was essentially as it is today. In fact the trail was included in trail guide map that was widely available at the time...that's how we discovered this trail.